Pakistan blogworld reacts: Global Voices Online. More blog reactions at TimesOnline. The killing of Ms. Benazir Bhutto is surely shocking and a condemnable act. The government and its agents are responsible in this. Mr. Musharraf! You have failed. We need security and peace in the country. Never before the country has suffered like this and never ever faced such turmoil. Its time for you to say “Good bye”. Maybe this will bring stability to the country. Go Musharaf Go! She was indisputably one of the most animated and vibrant individuals in Pakistani politics, she was so full of life that death is a concept that doesn’t really seem coherent with her image in the mind. This is inhumane.. killing a woman who was fighting for her country, fighting for a country which took away her father and her brother from her. Surely, she has entered a better abode. May God be with her. I pray for her and her family and Pakistan at this hour. I’m proud of my leader…. Benazir we are proud of you!!! 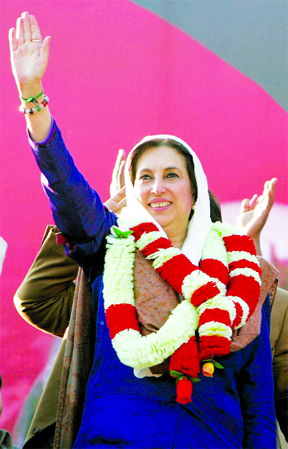 December 27th mark a historical event, as our beloved leader, Shaheed Benazir Bhutto departed from this world. This day is commemorated as a day of democratic victory. One year has passed to her assassination, but she is still attached to our hearts and feelings. Although, there were many threats to her life, but even then, she fought the battle against the corrupted people of our country with courage. She was not only the daughter of the east, but she was the true mother of the nation, who always treated nation as her children, and did many things for the reformation of the people as a mother. She was the intellectual treasure for us. She was the voice of many unheard voices. She never learnt to back out of any thing. She fought till the last breath to show her iron will and determined mission to work for humanity. She was brutally assassinated because of her good will and great thoughts to build our nation stronger. After Lady Diana and Mother Theresa, she is considered as an International icon and role models for many people. We salute her courage, bravery, talent, leadership qualities and her positive motives for our nation. Mourners still weep inconsolably and beat their chests, because such leaders are born rarely. It was a cowardly act to kill a democratic lady. Loosing such a great women makes us feel as if one of the family members of each of our family has passed away. We must continue her mission with dignified morals. Next post: Should we fear?